In our joyful world of Pratham Books, there are many endearing characters who are our best buddies, stories that we tell and retell and values that we learn and imbibe. But how much do we know about the people who create this make believe world for us ? We resolved to put this right, and decided to interview and bring forth few of our favourite authors and illustrators. Did you always want to be a writer? When did you first start writing? Yes, ever since I can remember I always wanted to be a writer. I wrote my first poem when I was in class III. A few more poems and stories followed. I took up writing quite seriously in college. I started by writing satire, adult fiction and poetry. How did you switch to children’s writing? When my daughter Ankita was five, I was invited to her school to address the students. I thought instead of giving a speech let me tell a story. I didn’t want to tell a tale, borrowed from somewhere. I thought about it quite a bit and wrote a story called ‘Just A Second’. It was about seven brothers, the youngest named Second and the eldest Year. It stressed on the value of time. I told the story in the school assembly. The response from the kids was just fantastic. They simply loved it. In fact when my wife and I went to a teacher’s house six months later she told me something which left a deep impression on me. “Mr. Kumar, the story you told that day had a great impact on the kids. Just the other day I was telling my students how important hygiene was. ‘Is it as important as the second, ma’am?’ asked one of my students. I looked at him with a puzzled expression on my face, not comprehending. During that time part of my responsibility, as a parent, was to put Ankita to sleep by telling her stories. Egged on by the response in the school, I created little tales for her. I found she lapped them all up. I wrote them down and sent them to children’s magazines. The stories started getting published and thus began my journey into the idyllic world of children. After my son Aniket was born and reached the right age he became an even more ardent member of my exclusive two member fan club. He would insist that I tell him a new story every day and he and Ankita would fight over the themes. While Ankita wanted the fairy tale, happy ending types of tales, my in-house Rambo wanted action and sports. So naturally Papa Scheherazade ended up telling both types of stories and thereby enriched his repertoire. Our daily tryst with tales created indelible memories. Sitting on the bed, on long summer nights, cold winter evenings and rain drenched twilights we used to laugh, jump, sing, dance and yes sometimes shed a tear or two as we explored the world of magic and mystery, action and adventure, sentiment and values. The tales created a gossamer fabric of trust and togetherness which, I am sure, we shall always cherish. I have dabbled in different types of genres such as fairy tales, fantasies, folk tales, fables and realistic fiction. However, my favourite is realistic fiction which I call the ‘Here and Now’ genre. This is the writing which is set in the present not in the ‘once upon a time’. Kids today face problems, get opportunities and counter predicaments which their earlier generations never did. Young readers can easily identify themselves with the characters in my stories. I write about kids who are ordinary but have to counter situations, which are abnormal. How they go about fighting adversity not with wands but with will power, not with spells but with intelligence, not with potions but with pragmatism is what my stories are all about. I have written about children who are victims of war, terrorism, riots as well as those who have to face the realities of a handicap, a broken family, alcoholic parents and marginalization of every kind. Then again my stories are not all about agony and angst, pain and perseverance – they are also about the fun, the joy, the pranks and the sheer unadulterated bliss of being young. I get ideas from anywhere and everywhere. By watching people, from everyday incidents, from stray conversations and above all from being with and observing children. A few of my most popular stories are based on remarks made by my kids. Then again, a large chunk of my work owes its existence to my imagination alone. Are all your characters imaginary or are they based on real life people? I rely on both experience and imagination with imagination getting a larger chunk of the credit! Which languages have your stories been translated into? My work has been translated into several Indian languages, as well as Mongolian, Japanese, Spanish, Sinhala, French and Chinese. I’ve read that your stories have been included in text books and anthologies. Can you give the details? One of my stories has been included in the text book for class nine students of Norway and another fable has been adapted as Kamishibai, the traditional form of storytelling in Japan. Tales penned by me have also found a place in the school text books in India as well as abroad. My stories, poems and satires have been included in several national and international anthologies including the popular ‘Chicken Soup for the Soul Series’. 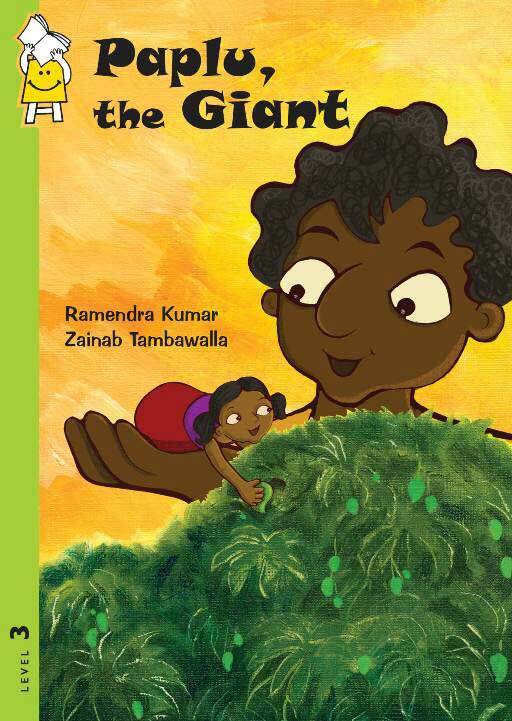 My latest book for young adults ‘Now or Never’ and a read-aloud book ‘Paplu the Giant’ have been recommended by Central Board of Secondary Education (CBSE), India, as Supplementary Readers for classes 7 & 8 and 3 & 4 respectively. My books have also been showcased in several international trade fairs including Frankfurt, Bologna, Moscow, South Korea, Pakistan et al. How do you divide time between your job at the steel plant, home and writing books? you’ll find the time for it. I am really, really passionate about writing. I hardly socialize nor do I go for booze sessions with colleagues or friends. I go to the club only for swimming in summers. My tryst with the idiot box is limited to the news or the odd sports event. So it is basically me, my family and my writing. Madhavi, my wife, has been a big support since she handles many of the daily chores leaving me to my obsession. A writer, someone said, is never unemployed. Even when he/she is looking out of the window he/she is ‘on the job’. The same thing holds true for me. In meetings and social gatherings where I am forced to go, I simply switch off. I have cultivated the art of sporting the right expression on my face during dull conversations so that the speaker gets the impression that I am all ears, whereas actually I am miles away in my own sanctuary of plots and characters, settings and milieus……. I haven’t tried this with Madhavi, when she extols the virtues of her mother, for fear of getting beaten up! Another aspect which helps me is my ability to ‘file’ stories in my head. Once an idea comes to my mind I keep nurturing and nourishing it till a complete story is formed. Many times the story stays with me for days, weeks, sometimes even months. This helps me a lot since I can plot when I am otherwise occupied and key in the stuff when I have the time and access to my laptop. How do you write? Do you need a perfect setting/place to write or you can do it anywhere, anytime? I know I cannot have the luxury to choose the time and place and create the right kind of ambience. I have cultivated the habit of writing quite comfortably in chaos, shutting out the world to create my own universe of creativity. And in this haven I write for as often as I want and as long as I want. Who are your favourite children’s authors? Are there any you have been influenced by? My favourite children’s writers are Enid Blyton and Frank Richards. And though Charles Dickens would not qualify as a children’s writer, I love his books such as Great Expectations and Oliver Twist whose protagonists are kids. I don’t think I have been influenced by any writer. If any one has influenced or inspired me it is my kids who are my greatest fans and sternest critics. What is the best part about writing for kids? What have been the benefits and learning along the way? Writing for children and being with kids has taught me that the only way to be happy is to be like them. If we carefully look at a four year old child we can learn a lot about living in the present. Whether the little one is drawing on a sheet of paper, or sailing a paper boat in a puddle or simply watching a bird in flight – she is giving her hundred percent to the present moment. I believe adults should strive to adopt the natural, unselfconscious behavior of the child. That is a far more effective way of seeking happiness than looking for packaged mokshas and branded nirvanas. When I’m in the company of kids I feel much younger and far more vibrant. Even a few minutes with little hearts and souls is like an injection of elixir. Will it be too immodest to say that I look much younger than my age because I spend so much time in the pure and pristine world of children? Are there any other children related ventures you have been involved in? I am also an inspirational speaker for children and I am frequently invited by schools to address students as well as to speak at seminars and workshops. I have been conducting Creative Writing Workshops for kids both in India and abroad and participating in leading children’s literature festivals. What is the advice you would like to give to the children who want to become writers? put it simply I would wish them to make writing their passion. Is there any significant incident connected to your writing which you would like to relate? A few years ago I had the opportunity of presenting a paper at the Asian Conference of Story Telling in New Delhi. During one of the sessions a lady with very impressive credentials in the field of Library Science and an equally impressive personality was giving tips to children’s writers on how to write for children. “All writers attempting to write for children should keep in mind that they have to go down to the level of children,” she concluded with a flourish, waiting for the applause which naturally followed. During the interaction session I raised my hand to ask a question. She transferred her imperious gaze to me and lifted her left eyebrow. She nodded impatiently. Obviously she didn’t have time to waste on a ‘non-pedigree’ writer like me. The auditorium in the India Habitat Centre erupted with applause. This encouraged me to speak against the patronising attitude which many publishers, critics and writers have towards children. Read more interviews with Pratham Books authors and illustrators.